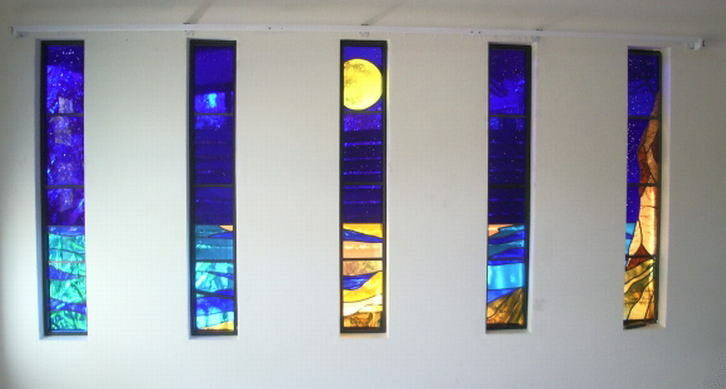 Employing tried and true techniques, Unicorn Glass Studio manufactures stained glass windows that will stand the test of time. Unicorn has designed and executed windows for, among others, the Army, Navy and Air Force chapels in Darwin, the Darwin RSL Club, Our Lady Help of Christians Catholic Church in Palmerston, The Holy Family Church in Sanderson, the Taminmin High School Library, the Palliative Care Hospice at Royal Darwin Hospital and most recently a 10 square metre window in St Mary's Catholic Cathedral Darwin. No job too big or too small: In 1990-92 we undertook a total restoration on the 500 square foot "Star of the Sea" window in St Mary's Cathedral Darwin. We regularly restore damaged leadlight panels in both antique and contemporary furniture.